29 years, 11 months, 27 days old age. Tintu Lukka will turn 30 on 26 April, 2019. Only 3 days, 1 hours, 38 minutes has left for her next birthday. Tintu Lukka has celebrated the total number of 29 birthdays till date. See the analysis by days count and bar graph. Tintu Lukka was born on 26-04-1989 in Karikkottakary, Kannur in the state of Kerala, India. She is an Indian Athlete. Tintu Luka is a renowned Indian athlete. She is holding the record for the fastest Indian to complete an 800-meter race. Olympic Gold Quest supports her to excel in her sport. Her mother Lissy Luka was herself a sportswoman and was a long jumper in the 1980s. Inspiring by her mother, she too took interest in sports since a very early age. Tintu’s school was around 5kns away from her residence and she used to go walking daily. She was highly encouraged by her school teachers to take sports seriously and was sent to Usha School of Athletics. She was trained under the guidance of legendary PT Usha. 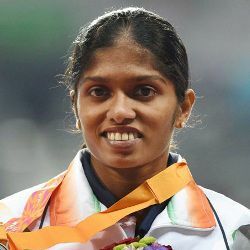 In 2008, she won her first international medal in the 800-meter race when she competed in the Asian Junior Athletics Championship which was held in Jakarta. In 2010, she created history by breaking a 15-year-old record of 800 metres event which was previously held by Shiny Wilson. She was short of experience when she participated in the 2010 Commonwealth Games but she came back with a bang in the 2010 Asian Games where she was able to win a Bronze Medal. In 2012, Olympics, she finished sixth and for her performance, Kerala government awarded her 2lakhs INR and also provided a job. She bettered her 2010 Asian Games performance in 2014 by winning her first silver medal and also won a gold medal in the 4*400 meter relay. She was crowned with Arjuna Award by the government of India in 2014.